Chunky wooden pLaque with 3-d star. 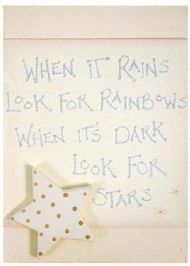 Reads "When it rains look for rainbows, when it's dark look for stars"
Wooden plaque with 3-d heart shape. 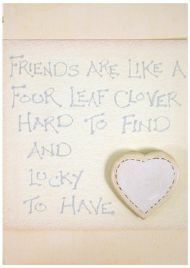 Reads "Friends are like four leaf clover, hard to find and lucky to have". Chunky wooden pLaque with 3-d star. 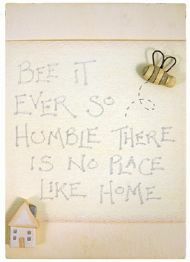 Reads "BE IT EVER SO HUMBLE THERE IS NO PLACE LIKE HOME". Hangs from string. Chunky wooden pLaque with 3-d star. 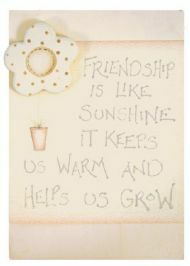 Reads "Friendship is like sunshine, it keeps us warm and helps us grow". Hangs from string. East of India wooden star sign. 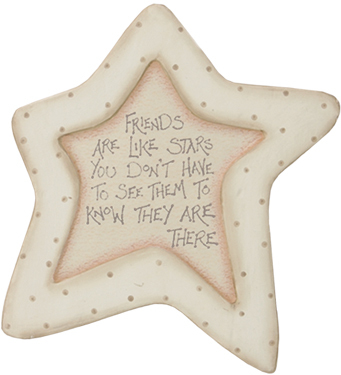 Reads: "Friends are like stars, you don't have to see them to know they are there"